Wow! 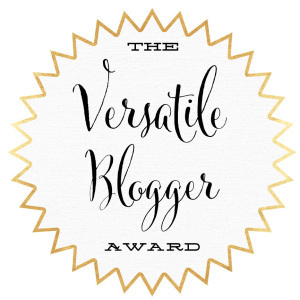 I’m so honored and amazed for being nominated again for The Versatile Blogger Award. I went back and forth on whether or not I should create a new post for a second nomination or just update my first nomination. I didn’t want to appear greedy by having two Versatile Blogger Award Posts, but on the other hand I really wanted to show my second nominator the love she deserves. So, as you can see, I went with a second post to not only honor the beautiful Grace of Prayers and Passports, but to also spread the love even more by adding new nominees to this post. In Grace’s words, “I’m breaking all the rules about ‘women of a certain age.” I love this mission statement. She is lighting the world “on fire,” seizing her moments and posting positive ideas. What is the Versatile Blogger Nomination? Within the blogging community there are several ways to support one another and recognize each other’s talents. You begin by following, then reading, hopefully commenting, retweeting, tagging them in communal posts, and, if you’re really getting involved, nominating them for cool awards like The Versatile Blogger. The only way to nominate is to already have been a nominee. It’s a great way to spread the love and show someone in the blogging community that they are important and worth sharing. No prize money or publicity photos doled out, just straight up appreciation for all of your hard work. It is an honor and should be treated as thus, but you should also have fun with it! After careful deliberation, I nominate the following bloggers for The Versatile Blogger Award. (Apologies if you’ve been nominated before, but maybe you’re just that awesome!) For this nomination I cast a wide net of versatility (pun possibly intended). I’ve included a link to their blog and their Twitter account name to make it easy for you to find and enjoy! For more awesome bloggers, check out the 15 I nominated on the last post. This was taken straight from the Versatile Blogger Award Wordpress post. If you’re reading this, then I’m fascinated with your interest about my life on this earth! I went into greater depths on my last post, so I’ll be quick here to break up the rhythm. I was born a blonde, but now it hides until the sun brings it back out. I love earthy colors, especially the blues and greens of the sky, ocean and forest. The bear is my spirit animal in the winter. I would love to eat and sleep all cuddly in a heap. The osprey is my spirit animal in the summer. I would love to soar freely, unadorned in the open skies. I really enjoy the blogging community. It’s one of the most positive and engaging groups/platforms I have belonged to. I can ice skate forwards and backwards, on one foot, turn and stop. My perseverance knows no bounds. Now take the ball and run with it! Thank you so much for the nomination! I’ve done it before but nevertheless I am still very grateful! That’s so cool that you can ice skate, I always wanted to be able to when I was younger. You’re very welcome! This was my second nom too. It’s never too late to try ice skating! Maybe a trip to New York for a nice ice rink adventure! Bears are the best! I definitely think it’s easier than roller skating!! You’re quite welcome for the nomination! You deserve it! Congratulations on your nomination!! I love reading facts about bloggers to get to know them better. I can relate to your winter spirit animal being a Bear! Keep up the amazing work, your site is great. Thank you so much for the kudos! Congrats on your nomination and thank you very much for nominating me. You rock!!! Thank You! Have fun with the post!